Christian Education Hour for all ages from 9:45 to 10:45 a.m. Learn more. Read full descriptions of these studies here. Architectural Photograph: Detail of a carving above the entrance to the Hugh Thomson Kerr Church School Building, where the Chapel of Shadyside Presbyterian Church is located. 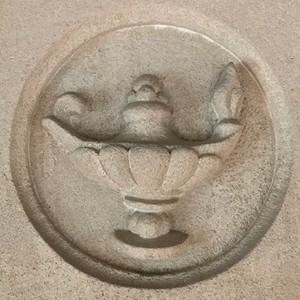 The lamp carving illustrates the Scripture: “Thy Word is a lamp unto my feet, and a light unto my path.” (Psalm 119:105).